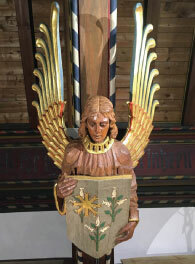 Several hand-carved angels have been watching over worshippers since 1921, when the building was completed. The present day United Congregational Church of Holyoke is the product of complex history of growth and consolidation of five separate churches responding to the changing demographics and spiritual needs of the city. Established in 1799, the First Congregational Church in Holyoke was initially a small congregation perched above the floodplain south of the center of town, sharing preachers with the equally sparse population of Baptists until the establishment of the First Baptist Church in 1826. The First Congregational Church was finally erected in 1838, and ten years later, the Second Church was established in to serve the needs of the growing Protestant population in the city center, building their own church in 1853 as the mill economy was booming. Reaching out to the millworkers, members of the Second Church opened the Grace Mission in 1870, which spun off into its own church in 1896. Skinner Chapel was founded in 1909 as an addition to the Second Congregational Church, dedicated to the prominent Skinner family. Finally, the German Reformed Church was organized in 1892, though meetings were held years earlier. In the latter part of the twentieth century, however, declining memberships in each of these churches led to a series of mergers, beginning in 1961 when the German Reformed Church united with the First Congregational to become the First United Congregational Church. Grace Church and the First UCC merged in 1973 to become Grace United, and in 1996, Grace joined with the Second Congregational Church to become the present UCC of Holyoke. 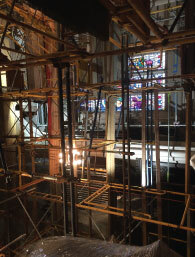 Scaffolding set up for a floor-to-ceiling cleaning of Skinner Chapel. The records of the UCC of Holyoke document over 200 years of the ecclesiatical history of an industrial city. In addition to records of membership, baptisms, marriages, and church governance, the collection includes valuable records of the women’s missionary society, the German Maenner Bund, and a long run of church newsletters that offer insight into the weekly course of events in the religious community.